Each year, Accrington Stanley players, coaches, staff and club mascot Winstanley make appearances at numerous community and corporate events. Although we are eager to reach every fan, availability due to training, travel and games is limited. Player appearances are a fantastic way for all Professional Footballers to give something back to their communities. Accrington Stanley will do their upmost to fulfil as many requests as possible. Prior to submitting a request please ensure you read our player appearance request guidelines so we may ensure all requests are appropriate and will benefit the communities of Hyndburn and East Lancashire. Requests must be received by email four (4) weeks prior to the event date. * Faxed/emailed/posted copies will NOT be considered. Clearly defined role or activity for the player, i.e. reading to a class, Presenting awards, etc. Use of the Accrington Stanley name, logos and trademarks and/or any advertising that implies the support or sponsorship of an event or organisation by Accrington Stanley must be approved in writing by Accrington Stanley. Before promoting an Accrington Stanley player appearance, please contact Accrington Stanley Community Trust for approval. This policy pertains to all forms of advertising, including all print, television and radio promotion. Once your request has been reviewed, you will be contacted by Accrington Stanley Community Trust representative and learn the status of your request (declined, pending or accepted) – due to the volume of requests, please allow 2 weeks for a response. If your request has been accepted, it has been done so in accordance with our player appearance policy. If changes are made after this time, we cannot guarantee that we will be able to accommodate the changes. 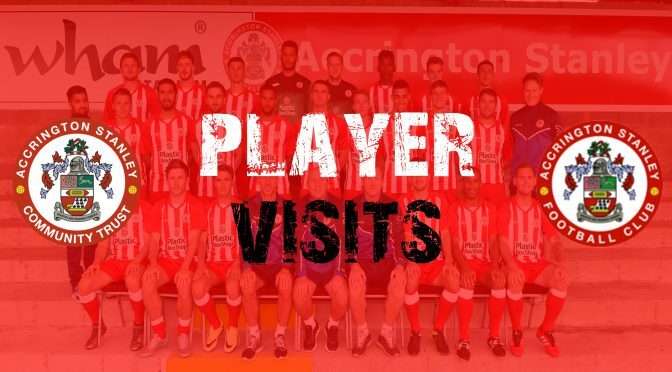 Accrington Stanley Community Trust don’t often make return visits to organisations within the same season, in addition an approved appearance does not ensure annual participation by Accrington Stanley Community Trust. If for any reason we need to cancel an appearance, we will notify your organisation as soon as we are aware of an unavoidable conflict. Thank you for your interest in making Accrington Stanley part of your event!